Tom Ward is the seventh son of a seventh son—so he occupies something of a magical position in life. Unfortunately, he needs to secure an apprenticeship, and, as the last of the sons in his family, there aren’t a lot of options let. But there is the Spook. A Spook is someone who keep the countryside safe from evil spirits—ghosts, witches and boggarts among them. Tom learns that being a seventh son of a seventh son is a good qualification. And the fact that he’s left-handed helps, too. Tom is immediately fooled during his first months of apprenticeship. When he is separated from the Spook for a few days, he decides to do a favor for Alice, a local girl who helped him out when bullies threatened him. However, unknown to Tom, Alice is the niece of a witch. She fools Tom into setting a very powerful witch free of the binding that the Spook has imprisoned her with. And when Mother Malkin breaks loose, everyone—Tom, his family and his little baby niece—are all in grave danger. Whose blood will the witch’s spirit feed on to gain her strength? High school housekeeping: I was looking for a very specific book when I read Revenge of the Witch. I wanted something for students who are working on their reading skills, and I wanted the book to be scary but didn’t want a lot of graphic violence. The problem I knew I would have—have had—is that most books like that are not scary or interesting to high school students. Their appeal is to younger kids. 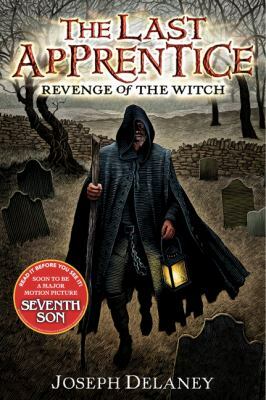 But I think Revenge of the Witch meets all of my criteria, so I’m recommending it. Some frightening things happen to the characters. Some of the things they fear are left to our imagination. Others are described just enough so that we know the terror the victims have gone through. Delaney goes a good job with the spine-tinkling, hair-raising elements of horror. If you are working on your reading skills, I recommend this novel. (The Lexile level is 840, which can fall anywhere between the fifth and eighth grade reading levels.) And the good news is that it’s the first in a series. If you like it, keep going. This entry was posted in Family Problems, Fiction, Hi-Low/Quick Read, Horror/Mystery/Suspense, Read 180, Supernatural, Young Adult Literature and tagged book reviews, hi-low reading, horror, Joseph Delaney Tom Ward, Read 180, scary stories, seventh son of a seventh son, The Last Apprentice series, YA fiction, YA literature. Bookmark the permalink.